In this article I want to write an easy, step-by-step guide on how you can transfer your blog from a free account hosted in Blogger to a Dreamhost powered WordPress installation. I’m writing this now as my memory is quite fresh from my recent migration and hopefully this will come useful to others who might be thinking of doing this themselves. In Step 2 Select the yearly option as it’s the most sensible for someone with a low budget. In Step 3 You don’t need to select anything unless you plan to run a lot of heavy scripts and have a bit of traffic. In Step 4, Uncheck Google Apps if you want to use Dreamhost’s custom options. This is a good option if you just a WordPress blog for now. You can always turn it up later. In Step 5, leave it as it is, and type the domain name you would like and a username for your ftp access. In Step 6, fill your information in. Go through the payment stuff and wait until you receive the “DreamHost Account Approval Notification!” email. Follow the email link and put your credentials to find yourself in your Panel. If you created a new domain in the previous part, you should see it now in the list. Press the “Edit” Button next to the “Delete” button in the middle. Switch your PHP version to 5.x. PHP 4.x is obsolete and you’ll run into problems with plugins and the like if you keep using it. Further down where it says “How do you like the www in your URL?” don’t leave it as “both”. Select the “remove www.” as this will help Search engines find you better. Press “Change fully hosted setting now!” to complete this step. WordPress should be already selected so simply scroll down. You should see an image similar to the screenshot on the left. In “Install to” you should see your domain. Leave it as it is, unless you want your wordpress site to a subfolder of your domain (ie /blog/). However I don’t recommend this. First because you can later on configure wordpress to show your posts under something like that and secondly because you’ll have to create some kind of splash or home page on your domain root for people falling there. This will probably be different from your site and won’t be counted in your wordpress stats. In Hostname, you can just leave it as it is. In Creating a user for the database, you can simply create the same user as for your ftp access so to cut down on things you have to remember. You’ll probably never use this anyway so it’s easy to forget if you put something new. Within 5 to 10 minutes, you should receive an email telling you that your installation is ready. Now that you’ve received the funky Dreamhost email follow the handy instructions within. Go to the install link and create your first user. Click “Grant Access” in blogger. If you’re using feedburner (and if you’re not, why aren’t you?!) go to your feeds, then to your blogger feed, and click “Edit Feed Details”. In the “Original Feed Location” replace your old blogger feed location with the new wordpress one. This is always in the form of http://yourblogurl/feed. Write a new post on your blogspot blog that you have moved and point to your new location. Once we setup your plugin installer, we’ll set up your blog to automatically redirect each post to your new location. That’s it. You have now successfully migrated from Blogger to WordPress In a next post I will explain how to migrate Intense Debate Comments as well, since the wordpress importer does not grab those automatically. Currently you should have created your wordpress site and migrated from blogger but you are probably at a very basic state. You should at this point configure a few options to make your life and look easier. Put a Tagline for your site. This will both be shown on your theme but also probably be seen by search engines as well. Under “Before a Comment Appears”, uncheck “Comment author must have a previously approved comment” This will reduce your management overhead. Under “Comment Moderation” increase the number of links to 3 since it is not uncommon for a non-spammer to include to links in the same post. Here you should set your permalink structure. That is the way your posts will look at your blog. While you can leave it as the default ?p=123, this generally looks ugly, is not rememberable and search engines don’t like it. Many people select the date based permalinks but I personally do not like that choice. This kind of setup is only appropriate for newspapers really. The only ones who should be using this are the ones who are writing an actual journal. My advice to you is to use a either a custom structure or a category based one. In a custom structure, you can use the simple /%postname% option which will make all your articles show on the root (ie http://dbzer0.com/this-is-a-post ) or put something in front to make it differ from pages. I prefer /blog/%postname% but it’s up to you. In a category structure, your posts will show under each category which is nice but if you tag sometimes in more than one category, an article may show under an undesirable one.In any case, whatever you choose does not need to be permanent. Even if you change your permalink structure in the future, wordpress will automatically redirect links going into a post that has changed location correctly so don’t agonize on making the perfect choice now. 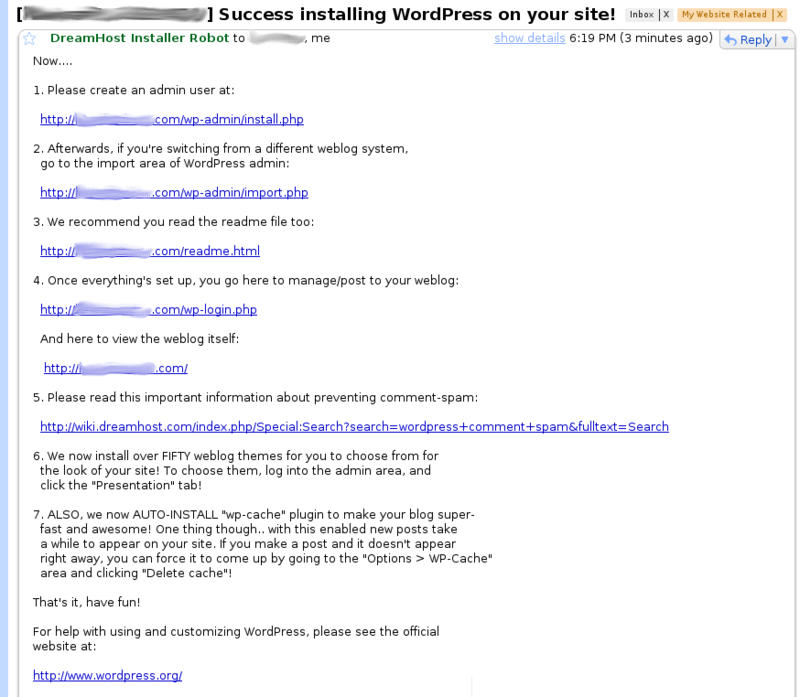 Plugins are the most exciting part of having your own wordpress installation. I’m not going to go into much depth but I want to mention how to set your installation up to allow you to install and manage plugins from the wordpress admin interface (instead of setting up ftp connections each time). Unfortunately we cannot avoid using FTP the first time. Use your favorite FTP client to setup a connection to your server. I recommend the excellent fireftp which you can use without installing software on your PC. Connect to your server. You should now be in a folder where your domain exists as a subdirectory. 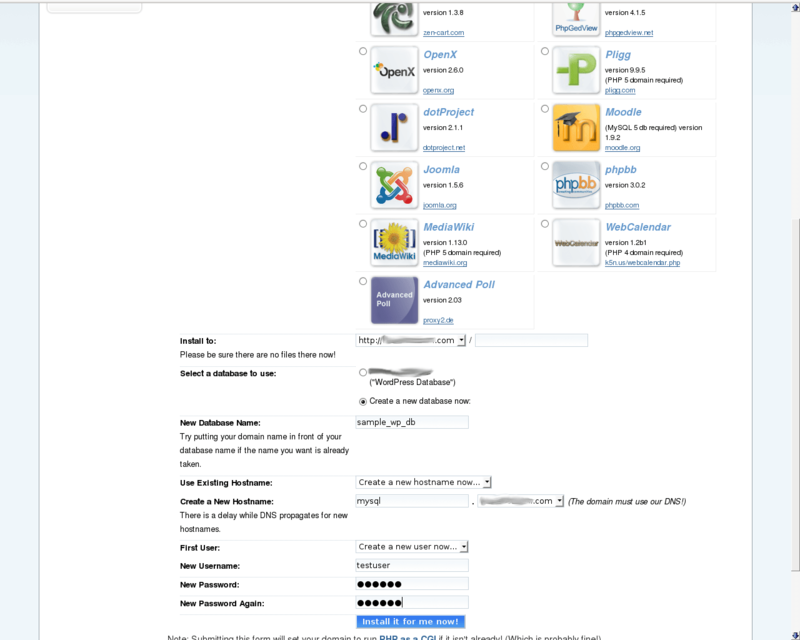 Enter that directory and then navigate to Wp-content > Plugins. Download the One-Click Plugin Updater and extract its contents somewhere on your PC. On the left-hand side of the split-screen, navigate to the place where you’ve extracted the zip file. Select the directory and click the little arrow pointing to the right between the split-screens. Wait until the job is complete. Scroll down to where it says “Inactive Plugins” and activate the One-Click Plugin Updater. This will make your plugin page show a little differently. Namely you should see yellow bars next to various plugins. That’s it. Now you have the ability to install new plugins and themes without using ftp and without even downloading and extracting files on your PC. Just follow the instructions that you can find in the “One Click Updater Miniguide” in your Dashboard. Hopefully this guide will help any of you who are thinking about self-hosting but don’t want to trust me or want to learn to do it yourselves. If you see anything I forgot or something I should include or make simpler, let me know. I cannot really understand why you insist on self-hosted blogs, too much fuss about nothing. You are not going to get more readers without wordpress or blogspot in the URLs. As a side note, I like your general views and that's why I am here. I am not reading blogs to learn about blogging itself ;). I generally do not insist, or pressure anyone about self-hosting but I personally swear by it. This whole project is to help people who already consider it. This looks very helpful. I bookmarked it so I can come back and read it more thoroughly when I have time. I already have a domain http://www.knowliz.combought Blogger thru GoDaddy. I have read 1000s of articles suggesting to move to wordpress.org. But I am kinda afraid to make a move and moreover don't really wanna start until I know exactly what I need to do and where I need to start. Can you suggest something in this regard? If you want, we can discuss through Skype or through any IM. Whatever is easy for you. I'm not certain exactly what more than this post you need. Can you elaborate? In fact I got the answer for my queries. I will start the transition soon. Can you just tell me what is the monthly operating cost if I make a move to wordpress as compared to Blogger? This is SUPER helpful. Got 1 question for ya though. I had been redirecting my dreamhost hosted domain to my old blogger blog. I want that to stop but when I go to take the blogspot url out in the redirect section it tells me I need to put something there. You're talking about the DH panel right? In that case, you probably need to select the correct radio button on the options. You should be able to select among something like hosted, redirect, transparent redirect etc.